For Fiscal Year 2019, when compared to the prior year through December 31, North Carolina experienced an increase in General Fund receipts which includes tax and non-tax receipts. Tax revenues increased by $469.0 million, or 4.5 percent, and non-tax revenues increased by $32.4 million, or 9.2 percent as compared to the previous year. The General Fund’s unreserved fund balance as of December 2018 was $1.03 billion as compared to $634.7 million as of December 2017. More detailed information is contained in the most recent monthly report on the General Fund compiled by the Office of the State Controller. This report can be found at www.osc.nc.gov. Click on the “General Fund Monthly Reports” button. The OSC website includes General Fund monthly budgetary basis financial information back through June 1998. 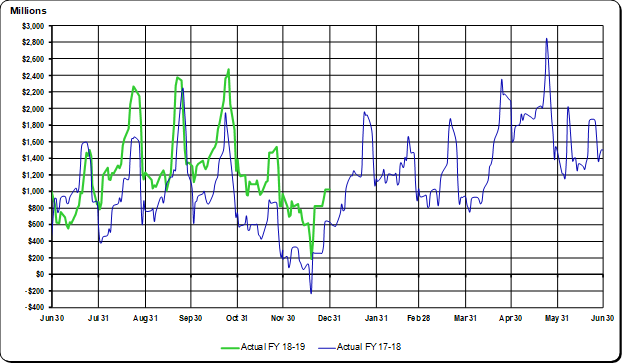 The following graph shows the daily fluctuation of the unreserved fund balance for the current and prior fiscal years.